Here's a refreshing idea! As part of an effort to promote responsible drinking and positive fan behavior at sporting and entertainment facilities, TEAM Coalition has launched a national campaign. With impressive backing from pro and collegiate sports, entertainment facilities, concession companies, stadium services, the beer industry, broadcasters, government traffic-safety experts and others, TEAM Coalition continues on a cross-country tour to save lives and improve fan experiences at events. One stop in the campaign was Chicago, home of the bowl-winning Bears. In Illinois, TEAM Coalition inflated a large Landmark Creations promotional balloon shaped like a football on a pedestal. The responsibility messages on the inflatable were "Great Beer, Great Responsibility" and "Bears Fans Don't Let Fans Drive Drunk." The 10-foot-tall balloon was positioned at the north entrance of Soldier Field where it will remain during all home games in 2010. Fans are invited to agree with the messages and commit to the responsibility by autographing the ball. It's all part of the nationwide "Responsibility Has Its Rewards" campaign. The goal? 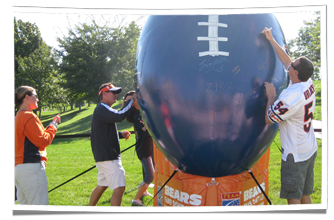 To cover every inch of the promotional balloon with the signatures of responsible Bears fans. Each signature represents someone who has pledged to have a designated driver and to never drive drunk. Many fans have even taken their photo with the ball after signing as a reminder of their vow. Why did TEAM Coalition choose Landmark for the honor of creating this giant inflatable football? TEAM Coalition’s Executive Director, Jill Pepper, explains: "Landmark came at the recommendation of the Chicago Bears and we couldn't be more pleased with the ordering process and the final product."